As the festival season is drawing to a close, DiS returns to Wales to find out about the highs and lows of putting together a multi-venue city event. Started by the Cardiff promoter John Rostron and radio presenter Huw Stephens, Sŵn festival (Welsh for “sound”) was inspired by visits to SXSW, Iceland Airwaves, and Manchester's In The City. Over the past decade it has secured a reputation as one of the best small festivals in the UK, giving opportunities to emerging artists who later went on to become internationally recognised names. As well as music, Sŵn 2016 featured a pop up Music Museum encouraging fans to share their personal stories, objects, and memories associated with music. Surrounded by the Swn Museum items resonating the importance of music to all of our lives, we sat down to chat to John Rostron about the tough business of promoting a new music festival, the injustice of music industry in the UK, and how David Cameron helped Welsh language music. DiS: Did you have a showcase model in mind when you first decided to organise a festival in Cardiff? John Rostron: We weren’t copying the music industry showcase model. We wanted a showcase festival for people. The places where Huw and I spent a long time were the small venues; so we naturally wanted it to be in the small venues. At the time it was only about the second city music festival in the UK, but we weren’t thinking about that. We just thought this was a good model. Have you acquired any interesting emotional or physical scars over your ten years with Sŵn? Oh yeah! We’ve made a lot of mistakes. We were overambitious at points. We lost a lot of money earlier on because we didn’t really know what we were doing. Managing debt was very challenging. I was so stressed when we were putting on the first festival, I split up with my then girlfriend. We’re married now so it’s all worked out right in the end. It was very difficult, but then with experience you learn how to manage the budgets better and how to manage your expectations. The workload is still difficult but it’s much more manageable. So you co-founded the festival together with Huw Stephens. How do you divide your responsibilities? We set it up together but Huw is not really involved in it now. In the beginning I didn’t know who to go to. I knew some Welsh bands, but he knew the Welsh language scene, agents, and managers. He would do all the interviews in the press and draw attention to the event, which gave us a head start. I was more of a producer, putting it together, booking the venues, selling the tickets, and doing the marketing. I know all the agents now and I’ve become better known in the Welsh scene, so I can book a lot of the acts. Huw was getting busier with his radio work and his role slowly drifted away, but when we started the Welsh Music Prize he came back to the fore. He’s very involved in the Welsh Music Prize. Do you have any full-time staff? There is one other member of staff. Two full-time people can deliver the whole festival. Plus, a lot of small freelance jobs and a huge army of volunteers who do stuff in the build up and on the weekend. What would be your advice to someone who wanted to put on a festival in their home town? Actually, what would you advise them not to do? It’s very, very, very tough. You need to be prepared for how tough it is. The best advice would be to put a little concert somewhere in a back room of a pub. Don’t start with putting on a festival. You need to learn how the industry works: how you book a band and pay a deposit…But you also need to go through that stress of: “Have I sold any tickets? Is anyone coming?” I would do that a number of times. Hopefully, nothing will go badly wrong, like nobody buys your tickets or the band gets stuck in France. Going through that stress is really important because with a festival; when you have 150 bands coming, you need to be able to deal with these situations. The first time I did it I’d done a number of concerts, but I still wasn’t prepared for the number of unexpected issues that happened on the day. We’ve had venues go bankrupt. We've had bands splitting up. We’ve had bands getting arrested abroad and only half the band being able to make it over. We were worried about selling too many tickets and too few tickets. We’ve had Mark E. Smith demand he had cash before he goes on stage, so we had to find £3000 at 11 o’clock at night. We’ve been through all of that, so now it doesn’t bother me when these things happen. With so many festivals around, ten years is a very long time. Why do you think Sŵn has survived and flourished? I don’t know if we do flourish. The economic model for putting on small gigs is very tough. Doing that on a bigger scale for a festival is tougher, and it doesn’t flourish in terms of commerce. It isn’t a good idea to get into it if you’re trying to make money. In fact, it’s a very bad idea. Commercially, it’s an absolutely stupid thing to do but we do it because it’s really important. We’ve created this disconnect in the music industry between our stadium bands or our festival headliners and our grassroots. Ed Sheeran who played in pubs is the same Ed Sheeran who walks on stage at Wembley, so commercially why aren’t those two things connected? Why is the money generated by that Wembley arena show is not legally in the framework that supports the grassroots? This isn’t about the promoter of that show paying his or her taxes and the Arts Council giving a grant to the venue; that’s not the route! When Ed Sheeran plays Wembley, through a direct tax or some kind of structure, some of that income should be linked back to small venues. Somewhere along the way we separated these two things and we need to put them back together again. That’s the bit that’s got to change. We’re beginning to have this conversation through the Music Venue Trust and Independent Venue Week. We run our festival in lots of small venues and I can see how difficult it is for them. I find it infuriating that we’ve put on dozens of acts that have gone on to play much larger spaces; yet there is no link back between the show they did with us or the show they did in that particular space and their economic success now. It’s not right that a local promoter puts on a new band for 200 people at a point where nobody is really sure if this band is any good or not, so she or he makes money or loses money. The industry wants those guys around when the new bands are coming through. The band do quite well, so when the next show rolls into town it is promoted by a national promoter and the local promoter doesn’t get a phone call. That’s not right! I don’t believe that a festival of new music should be supported by the Art Council. If I was at the Arts Council, maybe I would slam the door down and say: “No, we’re not going to support it. Music industry, you need to support it! Cut off the lifeline." How would you propose to make these changes? I don’t know what the quick fix solution might be. It’s an industry-wide issue and it’s not been addressed by the whole industry. We have PRS as a model that was established to ensure that songwriters are paid for the performance of their songs. We could introduce a new tax. For example, one percent of all box office sales at any venue always goes directly into kite-marked small venues in the UK. Then it doesn’t matter whether it’s Ed Sheeran who used small venues or if it’s the X Factor who didn’t use small venues - one percent of all box office receipts goes into an organisation like the Music Venue Trust, who kite mark the venues and then distribute funds. Then it’s not going through the Arts Council. It’s a direct tax and any promoter who puts on anybody has to pay their one percent culture tax in the same way they have to pay their VAT and their PRS. You’ve already mentioned Welsh Music Prize. Of course, the obvious thing about Sŵn is that it’s very much about Wales - the name, the location, the artists. 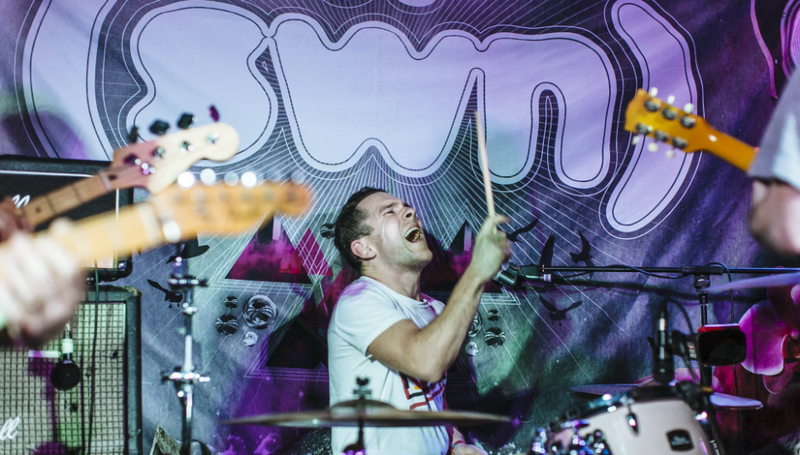 It’s also hard to ignore recent resurgence of the Welsh language music scene. Why do you think this is happening now? I think the Welsh language thing has been a long process. When I first arrived in Wales in the early 90s there were bands like Super Furry Animals, who were signed to Creation. Their Welsh language album Mwng got into the top 20 in the UK and did well abroad. Then you get to 9Bach’s record on Peter Gabriel’s label. They had loads of sold-out shows on their UK tour and they were singing entirely in Welsh, and in a very short space of time Gwenno released her record that got onto the 6 Music playlist; those two things happened very quickly. They have to be connected. A Welsh language track getting playlisted on 6 Music was a major step. I grew up with Vanessa Paradis on Radio 1 but when Meic Stevens released 'Y Brawd Houdini', which was an incredible poppy song, it didn’t get anywhere near the national radio. I think the Gwenno and 9Bach thing is an incredibly important moment. Another important thing that happened was the election leadership debates on TV. They introduced those in 2010, didn’t they? Then in the last election David Cameron accidentally did a really good thing for the Welsh language when he said he’d only appear on TV if other leaders were there as well. Suddenly you had Leanne Wood from Plaid Cymru on prime time national TV. They also sent reporters to the party headquarters when Plaid Cymru were releasing their manifesto. They went live to it and, of course, it was all in Welsh. The national radio clearly hadn't thought about that and the presenters were flummoxed. They’d seen Leanne Wood speaking English on TV but there she was, speaking Welsh. And their reaction was “What’s going on?” So Gwenno, 9Bach, and David Cameron opened the door for the Welsh language revival. All of those things happened at about the same time and ended up being incredibly positive. But when it comes to music is there such a thing as Welsh sound? I think the artists we pick for Sŵn sound are as diverse as the radio. That said, there is a particular sound with acts like Cate Le Bon, Alex Dingley, or H. Hawline. This kind of fuzzy psychedelia that feels particular to Wales. I haven’t really heard it anywhere else. Euros Childs and Radio Luxembourg have it. It goes back to Gorky’s Zygotic Minci with a little bit of Super Furrys; they pop up now and then. You’ve already mentioned that you and Huw started Welsh Music Prize. Is there anything else that links it to Sŵn? No, but when we started it, we started it at Sŵn. We made it the opening night at Sŵn to give it more attention. After a couple of years we moved it out by a month. I want people talking about music, the importance of music, about new bands, and Welsh bands on a regular basis. If we can do it for a weekend at Sŵn, and then a month later at Welsh Music Prize, that’s good for music. What really made Sŵn for me this year is the way you’re celebrating your 10th anniversary. It’s not about beefing up your line up with big names or using bigger venues, it’s about the Sŵn Music Museum or doing a behind-the-scenes documentary with a local company. Tell us a bit more about these festival fringe activities. I’m really glad that you’ve noticed that. Often people get to their birthday and just do a big event, and I can absolutely understand why they do it. But if you do that, what do you do the following year? Do you just go back to what you used to do? If you bring someone really big and have loads of big names, what about the small bands? I thought that SXSW went through the same kind of thing. I saw SXSW get to the point where one year it was like: “Prince might be playing in this cafe, or Jack White is playing over here.” Then you end up just talking about that rather than talking about all the new bands, which is what it’s meant to be about. This year they got rid of all of that and it was a much better event; fewer people came but it was still busy. It became about what it’s meant to be about, so ours was a very conscious decision. Then we also wanted to open up a conversation about music and what music means to people; and that was why we set up the Sŵn Music Museum with Cardiff University. I genuinely believe that everybody has a connection with music because people listen to music when they’re growing up, and everybody hears music every day. It’s like air, it’s all around us. I think it’s incredible, and we don’t think about it enough. We think about music as going to gigs and listening to records, but actually when you walk down the street you hear the sound of someone’s headphones or you hear the radio - we soak in music all the time. Music soundtracks our lives: key moments like our first love, first death, first heartbreak… So while we’re still arguing whether we should have small venues or not, whether bigger acts should pay a tax or not - yes, they bloody well should because music is the one thing that unites us all. We should all recognise that and invest in music. So how do you see the next ten years for Sŵn? I don’t know. There was a point somewhere along the journey where I thought: “Let’s get to ten. Getting to ten would be really good.” Now we’re at ten I’m seriously considering what I want to do and whether I want to carry on with it. I don’t know because it’s a lot of work, it’s very consuming, and it’s very difficult financially. I’ve being doing it for ten years; that’s a long time. The flip side is that it’s a really great event. And I really enjoy that it means so much to so many people, whether they’re playing, or volunteering, or coming to see the bands. And it also allows us to have these conversations, allows us to talk to the government and to talk to the councils. I don’t own a venue, so I can’t be a part of the Music Venue Trust. I’m not a musician, so I can’t be part of the MU. I wouldn’t join the Concert Promoters Association. But we need to shout about the injustice in the music industry. Sŵn helps us do that. I feel that’s really important because some of these venues or promoters might disappear. The festival is also a catalyst for doing other things. We’ve just had a grant, so we can deliver training to musicians next year, and we couldn’t do that without the festival. We wouldn’t have the gravitas, or the evidence, or the contacts with the bands. I’m trying to balance all of that up. I mentioned to Huw the other day: “Maybe ten is a good time to stop.” And he said, “Or five is a good time to stop, or 15, or 20.” So maybe. Maybe there will be Sŵn 2017. For more information about Sŵn, visit the festival's official website.